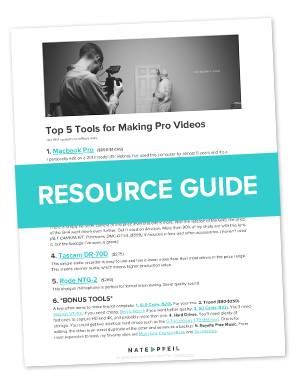 If you're wanting to create videos but feel overwhelmed when it comes to purchasing equipment, you're not alone. This can be one of the most detailed and overwhelming parts of starting a video business. This is why I wrote my simplified advice on 9 categories of equipment so you can know what to buy, even when you have nothing. If you have no idea where to start–this post is for you. If you own some equipment already and are curious only about which camera or lights to buy, this may be helpful for you too. The information below is based partly off of my direct experience and partly off what I know from the experience of others. Also, this is my unbiased opinion and none of the products or brands are affiliates of mine. Lastly, you can expect that some of the prices I list are not accurate since they're always changing over time. If you want the latest information, don't trust what I've written. Double check it in Google before you adjust your budget. Almost all guides I’ve seen start with the assumption that the videographer has a computer to edit on. What if you don’t? Which one do you need? This will be a substantial portion of your budget if you don’t have one already, and trust me, it's a worthwhile investment. I’m sure you could learn to edit on a fast PC and be just fine. I’m sure the differences between Macs and PCs are narrowing all the time and it’s not the same as it used to be. I'll also admit I’m biased since I’ve been using Mac for so long I can’t imagine anything else. But at the end of the day, the vast majority of all creative professionals, especially videographers, use a Mac. They’re not only incredibly reliable, but the basic computer operations are intuitive and super handy for creating stuff. Now that that's settled, which Mac? You can get a 15.5” MacBook Pro Retina used online in this price range. You'll have to dig around. This computer is great and packs a punch. I’ll even tell you a secret: It's my primary computer for my video business. I’ve edited video professionally on a 2013 MacBook Pro Retina since 2013. We're talking hundreds of videos. Tons of real client work. This option is good for you if you want a computer that can edit video and still be portable. It’s worked out great for me. Or you could go all in on one of these. The new MacBook Pro starts at $1,999 at the time of this writing. The highest model with all the upgrades you could ever need has a handsome price tag of $4,299. At first this scared me and was almost a deal breaker. My iTunes Library alone was over 60GB, so I knew I wouldn’t be able to keep any video projects on my computer. Nor my personal photos. But actually, this isn’t that bad. It seems the most common workflow for video editors is to use external drives anyway (more on those below). This means all your video projects live outside your computer on another hard drive and when you want to edit, you must have that hard drive with you. Also, now that most of us seem to be using services like Spotify and Google Photos, our music and photos aren’t on our hard drives anyway. The bottom line: of course a bigger internal hard drive would be better, but if you have to use a small one, you can survive quite easily. I have for a few years now and it’s really not a problem. 2. You need the 15” model. - Don’t go for the 13” model because it’s cheaper. There will be times you’ll even feel cramped on the 15”. I found these prices at macofalltrades.com. This is a desktop computer that won’t allow you to be mobile, but it’s more bang for your buck than the MacBook Pro. Actually, you can get them as cheap as $1,099 new, but that means a 21.5” display. The price I have here is for the 27” Retina 4K display, as well as the 5K version. This computer is perfect for video editing, and if I had to build a studio to last me for a few years, I would get this without hesitation. What if you can’t afford these? It’s definitely possible to find cheaper options for your computer. You could get an older version of these two computers on the same websites I mentioned, check out eBay or Craigslist, or look for deals from friends. My recommendations here are meant to simplify the time-draining process of figuring out what you need. When you’re editing video, your computer needs to be fast or you will waste a huge amount of time waiting for your machine to catch up. This amounts to real dollars lost over time because you’ll have less capacity to take on projects. And if you’re just doing this for fun, you won’t be having much fun just staring at your computer as it renders, unable to even browse the web while you wait. So I would encourage you to save up until you afford to pay at least $1,200-$1,500 dollars for a solid computer. rive The next thing you’ll need to invest in is a hard drive. More than one, actually. The good news here is that you don’t actually have to spend a ton of money to get started, as long as you have a backup. Setup 1 - $240-$260: Buy two identical hard drives. One for editing, one for backup. This hard drive is fast enough to edit video on, and portable enough to carry in your laptop bag if you’re on the go. The major thing to be aware of is the danger you expose yourself to. Since it’s small and portable, it’s more susceptible to being damaged or lost. If you put your project work on this drive and something happens, you better hope you have everything backed up. Which is why, if you do this setup, you must buy two to keep a backup of everything. You can use a software like Carbon Copy Cloner ($40) to keep your backup updated, or you can do it manually for free. Three good options for this setup are (1) the Promise Technology Pegasus2 R4, (2) the Drobo 5D, and (3) the G-Technology 8TB G-RAID. *The Pegasus R4 apparently comes with drives already installed. You can select 8TB or 12TB. However, it’s possible to replace these with larger capacity drives. **The Drobo bays could be filled with five 6TB drives at $230/ea., giving you a max capacity of 30TB for a total of about $1,750. My recommendation based on what I’ve used: The Drobo 5D. I’ve used three Drobos and two Pegasuses through the years. The Drobo software is much more user-friendly, and they have better prices. My recommendation based on the price: The G-Technology G-RAID. Though I’ve never used this drive myself, its specs, price, and reputation are hard to argue with. I’ve seen these used by creative professionals for years. And if you’re just starting out, 8TB should be enough storage for now. The bottom line with hard drives: You need a drive that is big, fast, and backed up. You could technically edit video on an iPad or a newer iPhone. It would be hard, but if you are just wanting to dabble in the craft, it’s not a terrible place to start. The basics of editing are the same across all programs. If you’re totally strapped for cash, start learning how to make videos right there on your phone. If you have an iPhone 6 or 7, your built-in camera is pretty great too. Don’t wait to start building your creative muscle until you have expensive gear. Make something with what you have! FilmicPro is an app you can get on your iPhone or Android that will enable you to manually adjust the camera settings, and even set the frame rate to 24fps, which is one step in making a cinematic look. They also have a great store of accessories for your mobile camera. If you take my suggestion on which computer to buy, you’ll notice that your machine already has an editor built in. iMovie is great for simple video edits, video montages, slideshows, and you could even edit an interview video if needed to. I’m not necessarily suggesting you start a business with iMovie as your editor, but if you had to you could. Tons of YouTubers use it. If you don’t have any experience editing, iMovie is a great program to learn on, and it’s free if you have a Mac. Adobe changed the game when it came out with the Creative Cloud. This is a subscription- based service that gives you access to pro-level software at a much more affordable price than before. If you’re going to be doing a whole range of things, such as designing in Photoshop and Illustrator, creating After Effects animations, and editing video, you’ll want to get the monthly plan that includes all the apps. It’s $49.99/mo. Or if you can’t afford that or don’t need the other apps, you can get access to Premiere Pro only for $19.99/mo. Premiere is all you will ever need in an editor. It’s great for everything from home videos and slideshows, to web videos, to short films–really anything. Even Hollywood features have been cut on Premiere Pro. The major competitor to Premiere is Apple’s Final Cut Pro X. I’ve never used Final Cut X and I switched from Final Cut Pro 7 to Premiere when the Creative Cloud was released. With either program, you can make something professional. While editing softwares all have their pros and cons, the most important thing isn't finding the best one. It's learning to be a good editor, regardless of your software. The information in this section is going to be cursory. There’s so much to say about cameras, so many options to choose from, and so many factors to consider that it can get overwhelming quickly. The most important thing: get a camera you can grow into and start learning how to use it well. DSLRs started changing the game for videographers back in 2008. Suddenly the common person was able to get images that were much closer to cinema by using the nicer image sensor and manual settings in their DSLR. If you’re just getting started making videos, pretty much any DSLR is a camera you have room grow into. But, here are my top DSLR picks. All of these cameras shoot HD footage. All of them could be used to run a business. All of them can make something beautiful if you learn to use them. My Recommendation: The Panasonic GH4. I have been a Canon shooter since before I was shooting video. Once I find something that works, it’s rare that I change. But when I saw the price, features, and quality of footage from the GH4, I couldn’t pass it up. It also shoots 4K. For now, I’m shooting exclusively with the GH4, though I’m definitely not done with Canon forever. In the future, I would love to get my hands on one of their higher end camcorders. But if you’re trying to choose between say the 5D Mark III and the GH4, there is no doubt that the GH4 is more bang for your buck. Tip: Buy your cameras used on Amazon. You can save a ton. For example, at the time of this writing, there's a used GH4 (regularly $1,497.99) for sale on Amazon for $958. I purchased two used and have to remind myself I didn't buy them new. The next level up from DSLRs are prosumer camcorders or cinema cameras. These include cameras like the Canon C100 MK II, or the Sony FS5 and FS7. If you can afford the C100, get it. This camera is awesome. Crystal clear image, easy to use, built-in ND filters, solid audio inputs, and more. Remember, you don't need it to be successful, but it is a very nice camera. At the time of this writing you can get a used C100 (not MK II) on Amazon for $2,250. The other cameras I mentioned are a lot more expensive, and I couldn't tell you whether they're better or worse than the C100. When you get to this level, the difference in quality between brands is something only serious camera enthusiasts and professionals nitpick about on Reddit. You don’t need any of these to create a successful video business. My recommendation stays on the GH4 or even the Canon 70D if you're just getting started. When should I upgrade my camera though? Until you know exactly why your DSLR is limiting you–that is, until you’re 100% sure it would be a total no brainer to drop $10,000-$20,000 on a better camera rig–choose to get better with what you have. Almost no one is limited by of the quality of their camera these days. It's possible to make a movie with one of these expensive cameras, but people have also made movies on the Canon 5D Mark II. On the other hand, people have also shot terrible, awful footage with a cinema camera. It makes me think of one author spending all her time obsessing over the best typewriter while a second author uses her pen to write 3 books. Which is better? Which is actually doing more writing? When I first started out I was surprised to know that tripods could cost so much. I’ve heard fellow professionals saying that you shouldn’t try to cut back on your tripod budget. It’s the one thing you would do well to invest in. Though it may hurt your budget a little, I've come to see that they're right. Here are a few recommended tripods, some I have used, and others I’ve only heard great things about. Video tripods really come down to durability, build quality, and the smoothness of the head. I would go for the most expensive one you can afford. This is the most widely used type of light in video for decades. It’s pretty much the standard. These lights burn hot, the light is sharp and direct, and they give off a warm golden glow at 3200K (which, in case you don't know, is a light temperature reading). The advantage is that they’re typically the most affordable option. Fluorescent lights tend to put off softer light, run a lot cooler, and are usually available in both daylight (5600K) and tungsten (3200K) so you can have most lighting environments covered. LED lights are highly efficient and burn coolest of all. These range from really affordable to really expensive. The advantage is that if you wanted to build a highly portable light kit with LEDs, you could. Also, many of the lights below can go from tungsten to daylight with the turn of a knob. Maybe you just don’t have the budget for any of these. That's not a huge deal. What matters is learning how to control and use lights (and not just having the nice ones). Here’s the cheapest route possible. The two basic microphones used in video are lavaliers and boom mics. This is the cheapest of the cheap, and though I can’t tell you for sure, it may be the worst of the worst. I’ve never used it, but I want you to know it exists. This is great because it’s budget friendly, but there’s a big disadvantage in that you can’t monitor the audio. The person being recorded has to keep the iPhone on their person, so you can only hope nothing has gone wrong (such as the mic coming unplugged) until after the recording. This is a bit of an industry standard wireless lavalier at the medium level. I’ve used them a lot and they provide very solid audio. The audio quality from this lav is incredible. If I have to choose between lavalier and boom, the choice is boom every time. I realize some situations call for lavs only, but in almost all interviews or controlled environments, booms are the way to go. As with each of these categories, there’s an entire world to discover in boom mics. But I’m going to majorly simplify. All three of these mics will create great quality audio, especially if recorded in a quiet room and placed closed to the subject. Once you get the right mic, you need an audio recorder. Most DSLRs use a dual system audio recording setup, meaning that the audio is recorded separately from the video. Some video cameras still have audio inputs that allow you to embed the audio into the video file (such as the C100 mentioned above). But for the most part, a dual system enables you to record higher quality audio than using a single system. The Zoom audio recorders are the most widespread, go-to recorders out there for videographers. They’re used by beginners and professionals alike. After using a Zoom for years, I got the Tascam DR-70D and I have loved it! Something about having real knobs makes using it better. It's also is less noisy than the Zooms I've used, so the audio is cleaner. I haven’t used this recorder, but I’ve heard some impressive results from it. Sound Devices has a reputation for making some of the best audio recorders you can find. I made videos for a long time before I realized how useful reflectors are. For example, if you’re shooting an interview by a window you may get shadows on the opposite side of your subject’s face that are too intense. If you set up a reflector on the other side, you’ve created another light source in a matter of seconds. You can also get 5-in-1 reflectors that have a semi-transparent option for diffusing the light. Reflectors are with me now at every shoot. As with reflectors, I was silly and shot video for a long time without using a monitor. It changed so much when I finally did. Seeing my in-camera image bigger had a direct effect on the quality of my shots. When you’re only looking at your image through a little screen, it’s easy to be zoomed in too far without realizing it. It's also harder to compose your shot when you aren't seeing it straight on. Monitors help both of these things tremendously. This is a nice cheap option if you don’t want to break the bank right now. But it is cheap. You can feel it. This one looks great for the price. I wish I had known about it when I bought the smaller Dot Line above. In addition to being a great monitor, you can actually record higher quality footage onto this device instead of in your camera. I can’t tell you how much I love using a Pelican for my most important gear. I'm able to carry two cameras, three lenses, camera monitor with arm, audio recorder, mic, XLR cable, ND filters, tape, and all my batteries and chargers in a single case. I use the Pelican 1510 Carry On Case ($152.22). It fits in the overhead compartment of an airplane, meaning you don’t have to check your most important gear when you travel. Note: the 1515 Padded Divider Set ($64.68) is a must-have for this case. Don't try to save $70 by cutting and using the included foam. I once spent 2 hours cutting it out to perfection and in a couple months it was all ruined from every day use. It's good for some things, but not camera gear. You will need this more than you realize. Maybe a joint is weakened on your mic stand and you need to hold it in place. Maybe you need to mark a spot for your talent to stand on the set. This stuff is strong and doesn’t leave a residue, making it something you don’t want to leave home without. You’ll be surprised how much you’ll be needing extension cords, power strips, and power hubs. Especially for your lights. The basics will do here. I love using one of these myself. (That name!) This will save your feet many trips and your back many aches. It’s more than worth it if you’re always hauling lights, cameras, tripods, and whatever else from place to place. This should all give you a pretty good idea of what goes into a video production kit. Of course, there’s always more. The biggest danger you need to be aware of is spending way too much time weighing your options and not doing the thing that actually matters. Making the calls, asking for referrals, creating beautiful work. I’m as guilty of this as anyone. What pieces of equipment are most important to you? Leave a comment and let me know. I’d love to hear from you. My hope is that you now feel more equipped to build your production tool arsenal and go make something great.